Researching the family of my ggg grandmother Susan has been like searching a muddy creek looking for clues with reeds blocking my way. The thing is Susan was a Reed and for a time members of her family lived at Muddy Creek. The main challenge has been the family name. My ggg grandmother and her siblings were christened as Reed . She and her family were Read on the 1841 and 1851 UK Census and on Susan’s death record. Despite the variance, I had chosen to call Susan and her parents and siblings by the surname Read. Then I found that Susan’s brother William was living just down the road from her in Victoria. In 1866 when William married Sarah Burgin, he was William Read. By 1869, and the birth of William’s first child, he was Reed. That was the surname taken by his children and that went with him to the grave. Even though the “Reed” name was consistently used by William from 1869, always lurking is the thought that at sometime the name may be Read. Or Reid. Especially in the newspapers. Susan and William’s story began in Cambridgeshire, first in Melbourn where Susan was born in 1830 and then Whaddon where William was born in 1835. They remained in Whaddon until they left England. From the 1841 UK Census, the Read family of Whaddon appeared a fairly typical family in the village. Parents William Read and Mary Waymant had four children, Susan being the eldest. 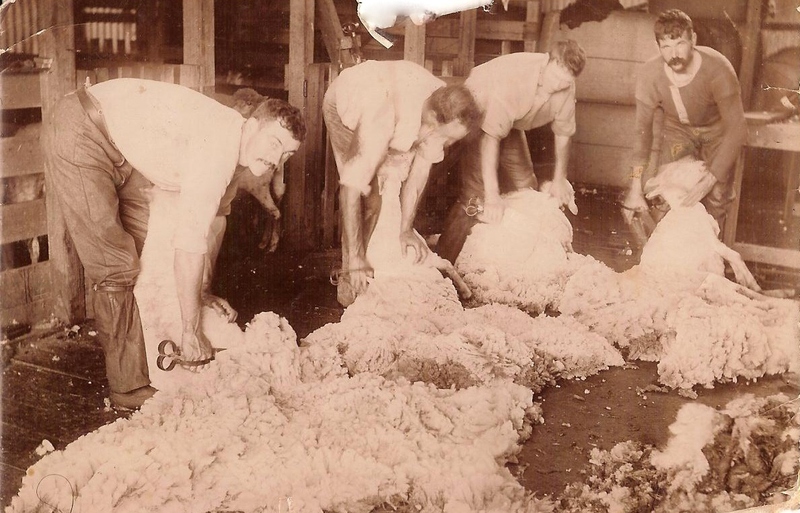 William senior was an agricultural labourer. By the time of the 1851 Census it was clear that over the preceding decade, life for the Read family had changed somewhat. Susan, recorded as Sussanna was now head of the household, her occupation “pauper”. There were two new children in the family, Julia aged 7 and John aged 6. They, along with Sybil then 13 and James 11, were also paupers. William jnr. 16, was working as an agriculture labourer. The most noticeable difference from the 1841 Census, other than most of the family being paupers, is that parents William and Mary were not in the house on the night of the 1851 Census. No amount of searching has found a trace of them on that night or there after. The other missing family member was Isabella, then 16. I found her in Bassingbourn working as a servant. She married in 1853 to Henry Cutts but she died in 1856. In addition to the information on the Census, in 1847, another child was born to William and Mary, a son Alfred William. Like his parents, I have not found any further trace of him. If William and Mary had died by 1851, it raises questions about Susan’s emotions about leaving for Australia in 1852, shortly after her marriage to James Harman. Departing would have been heart wrenching enough, but to leave her brothers and sisters under such circumstances must have been extremely difficult for Susan. She named three of her children after her siblings, Alfred, Julia and Isabella. Sometime over the following eight to ten years, William jnr left England for Australia but I have not been able to find his arrival in Victoria. A lot of “William Reeds” and ” William Reads” arrived in Victoria during the 1850s and 60s and that is assuming he came directly to Victoria. He had arrived in Australia by 1866 as he married Sarah Burgin in that year. Sarah was the daughter of Richard Burgin and Eliza Addinsall and was born in Lincolnshire, England in 1846. The Burgins arrived in Geelong in 1854 aboard “Josuha“. They settled at Muddy Creek, south of Hamilton. WILLIAM – Born 1869 at Macarthur; Died 1952 at Hamilton; Never married. ELIZA MARY – Born 1871 at Hamilton; Died 1954 at Hamilton; Marriage – James Percy CLAYTON in 1896. MARTHA – Born 1873 at Macarthur; Died 1945 at Warrabkook; Marriage – James Ernest FORD in 1901. ALBERT – Born 1874 at Warrabkook; Died 1954 at Hamilton; Marriage – Elilias PATMAN in 1904. JOHN – Born 1877 at Warrabkook; Died 1878 at Warrabkook. SARAH ANN – Born 1879 at Warrabkook; Died 1948 at Hamilton; Marriage – William KIRKWOOD in 1903. ALICE – Born 1882 at Warrabkook; Died 1974 at Hamilton; Marriage – Henry Alfred BREWIS in 1904. Another difficulty with William Reed is that he lived at both Warrabkook near Macarthur and Muddy Creek, near Hamilton, but he could also be recorded as living at South Hamilton as Muddy Creek fell in the Parish of South Hamilton. I also can’t rule out nearby Yulecart being used as his place of residence. So that leaves me searching for William Read or Reed (or Reid) at two locations with four possible place names across the same time period. In 1888, William was executor of his father in-laws will. Noted was William’s signature, “William Reed” and his residence Warrabkook. 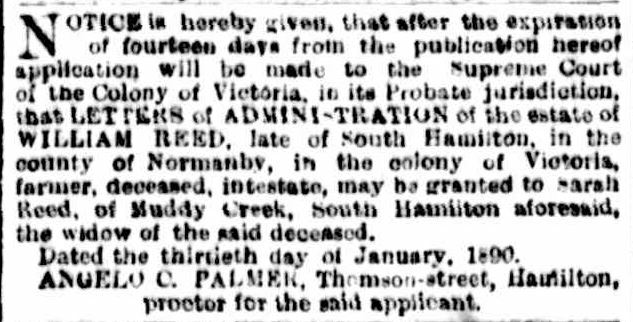 Not taking a lead from his father in law, William passed away the following year, on December 23, 1889, intestate. William’s two brother-in-laws William Burgin and my ggg grandfather James Harman, lodged applications to administer the estate. However, William’s wife Sarah was granted administration. The notice, below, said William was from South Hamilton while Sarah was from Muddy Creek, South Hamilton. William was buried at Hamilton Old Cemetery and his headstone recorded his place of death as Muddy Creek. It was William’s’ probate papers that told me more about him. William owned six properties at the time of his death, three in the Parish of South Hamilton, two in the Parish of Warrabkook and one in the Parish of Yulecart. One of the properties in South Hamilton of 94 acres, had a five-room stone dwelling with an iron roof and all walls plastered. One ceiling was still canvas lined. There was also a stone out building. This would have been the Reed’s Muddy Creek residence. The other two smaller properties were next to the “home paddock”. They were all partially fenced with an old log fence and post and wire. There is a clue to how long William may have been at Muddy Creek. The improvements on the properties had occurred over 30 years. That would go back to around 1859. This list of tender bids, presented at the District Road Board on February 20, 1863 includes a W.Reed who lodged a tender to repair the ford at Muddy Creek. He did have the cheapest quote but he was beaten to the job by contractors, Vivian and White. The two properties in the Parish of Warrabkook were close by to the Eumeralla River and they can be seen on the Parish of Warrabkook map from 1879. John Kirkwood, father-in law of William’s daughter Sarah owned the property to the west. To the north was the property of William Burgin, William’s brother-in-law. The larger property of 229 acres had a four room mud dwelling with a two room wooden add-on. There were three brick chimneys and the walls were papered. Two rooms had pine lined ceilings. This would have been the Reed’s Warrabkook residence. Improvements on the property had taken place over 22 years, beginning around 1867. 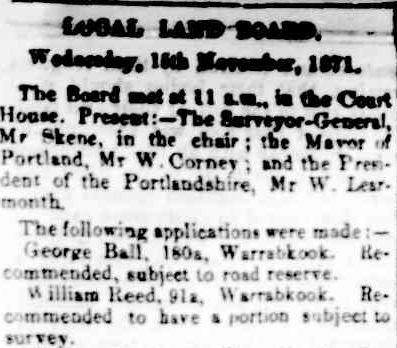 This Local Land Board notice from 1871 reports on an application from W.Reed of Warrabkook. It seems that while William may have bought land at Muddy Creek first, he and Sarah spent the early years of their marriage at Warrabkook, although there did seem to be some going backwards and forwards until their third child, Martha was born. It was some distance between Muddy Creek and Warrabkook, but I think William may have taken a shorter more direct route than Google Maps offers, with a distance of around 42 kilometres. Susan lived at Byaduk on the way. The map below shows Warrabkook (A), Byaduk (B) and Muddy Creek (C). Later they seem to have spent more time at Muddy Creek. There was a strong Methodist community and the Reeds were members of the Muddy Creek Primitive Methodist Church. In 1929, Sarah Reed laid the foundation stone for a new Muddy Creek Pioneer church . Daughter Martha’s wedding notice from 1901 has Sarah from Muddy Creek and Warrabkook. While I can’t find William Reed’s South Hamilton properties on land maps, the road names around Muddy Creek/Yulecart give a clue. Like at Warrabkook, the Reed, Burgin and Kirkwoods were never far away from each other. 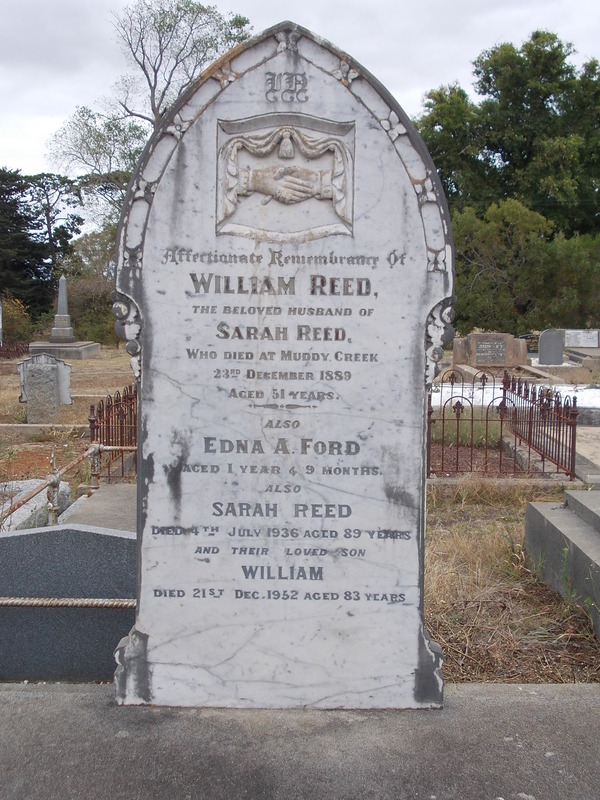 Until now, I have recorded Susan as Susan Read on my family tree and William as William Reed which is a bit messy. Writing this post as forced me to look harder at the sources and I have decided that I will change all those I have listed as Read to Reed as that is what Susan and her siblings were christened. I will still need to factor in the different name variables. William and Susan were not the only Reeds of Whaddon to come to Australia. Their sister Sybil lived in Ulmurra, New South Wales. Her husband John Revell was the puntman on the Coldstream River at Ulmurra. 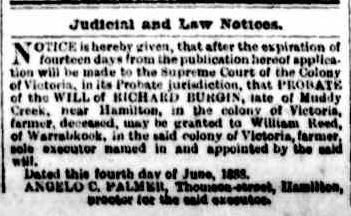 At the time of Sybil’s death in 1903, Susan placed a notice in The Hamilton Spectator for her younger sister. So for at least three of the Reed family, life improved and the move to Australia must be attributed to that. William would not have owned six properties had he stayed in Whaddon. Although they led hard pioneering lives, at the end, I doubt they had few regrets. This entry was posted in Harman and tagged Addinsall, Brewis, Burgin, Clayton, Harman, Kirkwood, Muddy Creek, Patman, Warrabkook. Bookmark the permalink. I know there is symbolism to all the types of grave monuments, but I don’t know what those clasped hands are – a couple together? re the 1851 Census: was it taken at the height of Summer? maybe the Ag Lab parents were out of the house that night doing some kind of harvesting? We all know that here in Western Victoria January baling hay is done all night to get it before rain can wet it (there is always a heavy rainstorm near Australia Day). And poor Isabella dead at 21 after 3 years of marriage. As usual, a magnificent researching effort, and with the Reid/Read/Reed handicap as well – of course it must be Reed as that’s what they had carved in stone. 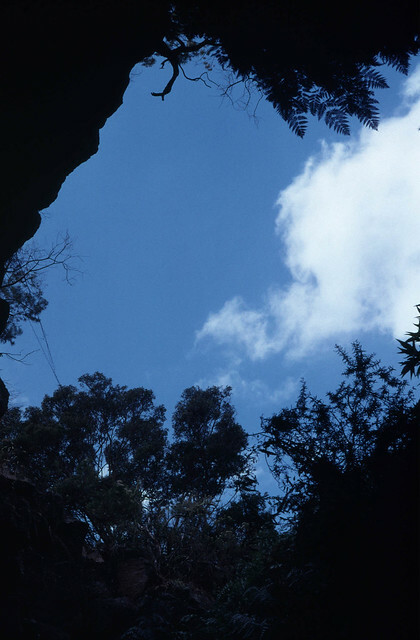 Forgive me for forgetting if you have blogged on The Harman One Cave? The Flkr account has an image of Warrabkook stone walls too. Another great reportIalways find afew names I do not have, keep up the good work Warren.